Toyin Ojora Saraki, Founder-President of the Wellbeing Foundation Africa, addressing the International Confederation of Midwives. 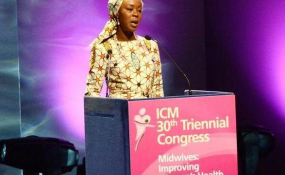 Her Excellency Mrs Toyin Ojora Saraki, Global Goodwill Ambassador of the International Confederation of Midwives, has condemned in the strongest terms the murder of International Committee of the Red Cross midwife Saifura Hussaini Ahmed Khorsa. Copyright © 2018 Wellbeing Foundation Africa. All rights reserved. Distributed by AllAfrica Global Media (allAfrica.com). To contact the copyright holder directly for corrections — or for permission to republish or make other authorized use of this material, click here.